by Eugen Rosenstock-Huessy. Brendow Verlag, 1987. 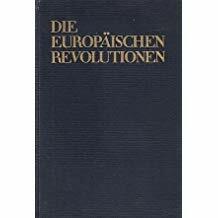 Die Europäischen Revolutionen is the book from which Out of Revolution was written. The English language edition is not a translation, however. Rosenstock-Huessy re-wrote the book with the help of friends. This German original is differently organized and has a different text. While the peoples of Europe were tearing apart one another in the Great War of 1914-1918, Rosenstock-Huessy, himself a German officer at Verdun, had a great vision of the convergence of the cultural heritage of the different peoples of Europe. The thrust was that every European nation had developed its distinguishing character in a great revolutionary upheaval, an inspirational period. These upheavals molded the spiritual and cultural outlook of the respective nations. The people of these nations carry these revolutions on as their cultural heritage. This period of the revolutions runs from 1076, when the Italian character was formed under the influence of the revolutionary Roman Pope, until the Russian Revolution of 1917. The Russian Revolution is presented as an introductory stage of the two World Wars, which have finally done what Communism could not do, making the peoples of the world dependent on one another. For a further description of the these ideas, see Out of Revolution.